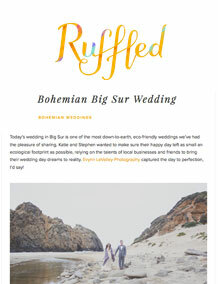 Kate Healey's flower designs are spotlit in many popular wedding magazines and blogs: Style Me Pretty, 100 Layer Cake, Brides, Ruffled, Snippet & Ink, and Junebug Wedding among others. 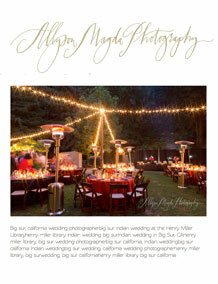 Scroll below to enjoy wedding videos that feature Kate's flowers at the seasides, forests, and hillscapes of Big Sur. See Kate's flowers in this video of music duo Dawn and Hawkes' wedding at Partington Cove.